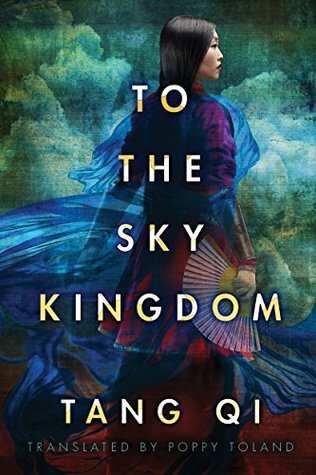 To the Sky Kingdom was one of the least straight forward books I have read in a long time. It felt very much like an oral tale with it’s twist and turns and weird little back flashes of stories within the story. It is very much a mythical story with gods and immortals having great drama and political intrigue together. I don’t really know anything about taoist beliefs, so I don’t know how much of this was part of that tradition, but the story did feel like being dropped into a fully formed world with a million backstories already in place and active in the world. This story evolves around two grand stories – one is a romantic love story while the other is about a master-apprentice relationship. I wholly enjoyed both of these. It is also a very dramatic story with high action, romance, intrigue, confused identities (like in a Shakespearean play), family, obligation and humor. I loved how human the immortals were, how the different cultures within the story clashed and intermingled, how Bai Qian (the protagonist) wasn’t perfect but as flawed and mosaic as any real person. It is a grand story. As I said I have not read any Chinese books before and at the start the names did confuse me, but I made a little mind map of the relationships in the books and that really helped – after that I wasn’t confused by the names again. I read the book with my book club and I am looking forward to hearing what the others think. The book had me in tears more than once with heartache for the characters. I was also quite confused at times. If you want to read something different and like mythological inspired fantasy, please consider To the Sky Kingdom.